RRB Group D 2018 exam dates out, railway couduct exam from 12th august. Railway Recruitment Board(RRB) released exam dates of Group D examination 2018 for recruitment of 90,000+ vacancies. According to Hindustan Newspaper, RRB group D 2018 exam will be start from 12th August 2018. Group D computer based screening test will be held in 5 schedule dates, starting from 12th august 2018. The first stage of the CBT will be conducted on 12th August whereas the last stage will take place on 16th September. It is estimated that for 90,000 posts a total of 2,00,00,000 applications have been received by RRB which is far beyond the expectation of Railways Recruitment board. Now exam date are confirmed for RRB Group D examination on the behalf of Hindustan Newspaper. Candidate are advised start preparation for the examination if not start. You can check detailed syllabus of RRB group D examination. 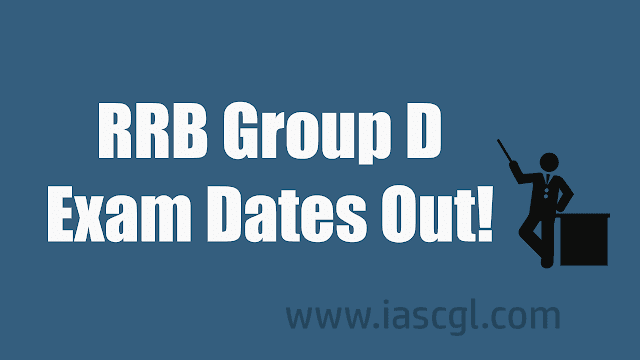 Official Notice for RRB group D exam dates. The written examination RRB Group D will to be held from the month of August to September at 500+ centers across the country. RRB soon release official notice for the RRB Group D exam dates. The candidates who will be selected in the final merit list, will be able to join from the next year. To recruit on the posts under Group D, the interview will not be conducted.